Residents of Papalanto and neighbouring communities in Ewekoro Local Government Area of Ogun State and the state Police Command were shocked on Tuesday to discover that the remains of a missing woman, Raliat Sanni, was found buried inside a church building. Raliat whose two hands and head were severed, was buried in an uncompleted church building,The Nation reports. 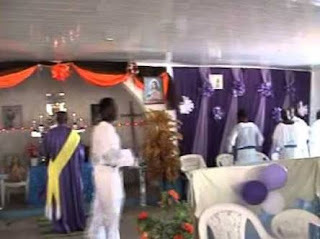 The Police arrested a pastor of Holy Gathering Evangelical Church of God, Papalanto, Oluwatobiloba Ipense, in connection with the killing of Railat and burrying of her remains inside the church building for ritual purposes. The suspect claimed that the victim was his ‘secret lover’ before she was hacked to death and mentioned one Pastor Daniel Sopeju of Iyana Egbado as his accomplice. The Commissioner of Police, Ahmed Iliyasu, who led journalists to the crime scene and also supervised the exhuming of the decapitated body of the victim, said Ipense and his accomplice, Daniel Sopeju, were arrested last March 26. Iliyasu added that the Command received a report of a missing person at its Divisional Headquarters in Ewekoro on Monday 26th March. “The case was reported by one Adebola Saheed that his younger sister, Raliat Sanni left home since 21st March and had yet to return. “On the strength of the report, our operatives at Ewekoro Division led by the Divisional Police Officer, OluwarotimiJeje, swung into action and embarked on technical intelligence investigation,” he said. According to the Police Commissioner, analysis of the facts surrounding the disappearance of the victim, showed that the suspect was the last person that had contact with her. Iliyasu said upon interrogation, the suspect who claimed to be a pastor in charge of a Cherubim & Seraphim church in Elebute area of Ewekoro, confessed to killing Raliat and buried the remains inside his church after removing her head and two hands. But Ipense had denied killing the victim, claiming his accomplice, Sopeju, killed her. “It was not true that I killed a woman, it was one Mr Sopeju Daniel and a woman wanted to make me join their occultic group and they said that they are going to collect a ransom. “So they collected the names of my members and picked the name of Raliat Sanni. Having mentioned her name, they asked me where she was living and I told them she is living at Wasimi. They later got her and brought her to my church. “Mr Sopeju brought out a knife and beheaded the woman and after beheading her, he collected her blood and put it in seven calabashes,” Ipense said. However, when his comment was sought, Sopeju admitted that he and Ipense belonged to white garment churches in the area but denied involvement in the killing of Raliat.